Earlier this year, I stayed on a houseboat in Amsterdam for a week. (Withhold your jokes.) It seemed like the perfect find — centrally located, very Instagrammable, and oh-so-gloriously cheap — until I realized it had no electricity. I can do without a lot of things, but a charged cell phone isn’t one of them. And since my deposit on the place was already locked in, I had no choice but to frantically start searching for alternative ways to keep my lovely little iPhone 6s alive, which hopefully wouldn’t involve me stealing electricity from a nearby restaurant: Perhaps seven pocket-size portable chargers? A mini-generator? Right as I started getting desperate enough to legitimately consider solar power, I discovered the Gogyre 21200mAh Power Bank. I’m still not sure how it’s even possible, but this $22 rectangle not only kept my phone charged for an entire week of Snapchatting and Facebook-status-updating, but it also kept my friend’s device charged too. Unlike your average portable charger, the Gogyre has two USB ports so you can charge multiple devices at once. It also comes with a built-in flashlight, which may at first seem a little strange, but is actually surprisingly useful (especially if you happen to find yourself on a houseboat with no electricity). 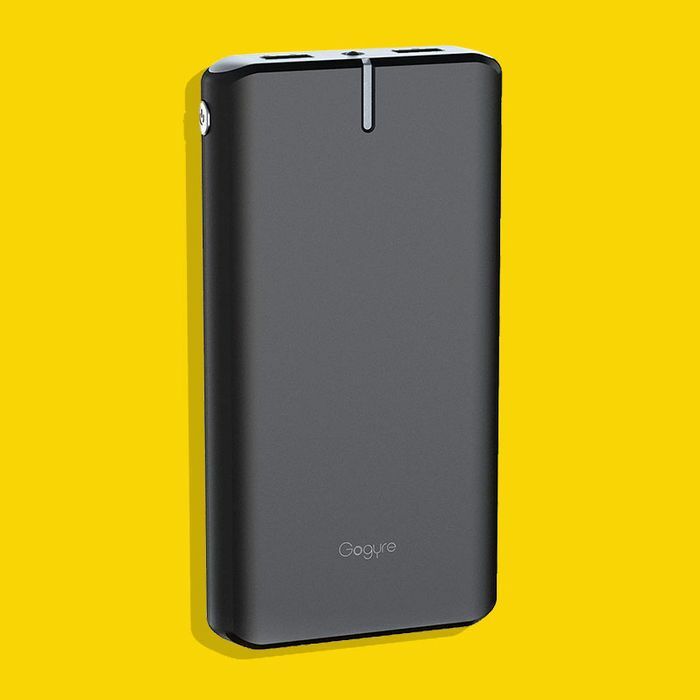 The Gogyre has a 21200mAh charge capacity, which — in English — means you should be getting about nine full iPhone 6s charges (or 6 Samsung s6 charges) per use. It’s worth noting that these are full charges — meaning from zero to 100 percent — so if you’re not a monster who uses their phone until it’s completely dead, you’ll definitely get more out of it. At first I thought the Gogyre’s size would put me off after I returned to the real (electricity-rife) world; however, eight months have passed and I still carry the thing with me absolutely everywhere I go. Despite being bigger than a “normal” portable charger, the Gogyre is surprisingly portable. I haven’t had any trouble fitting it into even the smallest of purses, and my dad — who got one for his birthday this year — tells me he simply slips his into a pocket. I almost always forget to charge my phone while at work, so it’s the perfect way to avoid the dreaded music-free-subway-ride-home situation. And even with this kind of daily casual use, I only find myself needing to recharge the Gogyre about once a month.